WHOI scientist Scott Gallager is making field observations and conducting lab experiments to explore the possible effects of microplastics in the ocean on marine organisms. 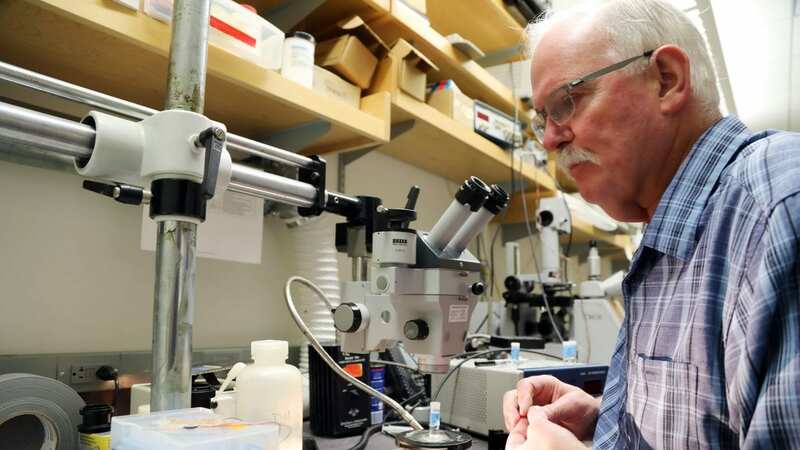 Specifically, he’s looking at sea scallops at different life stages to determine if the tiny plastic fragments they ingest when filtering seawater stunt their growth. The work is part of WHOI’s Marine Microplastics Initiative, which is aimed at understanding the fate of “hidden” microplastics in the ocean and their impacts on marine life and human health. Q: Why did you choose scallops for this study? A: Scallops are the most valuable fishery in the United States, with an estimated $750 million harvested annually. If microplastics are hampering them in any way, we need to know that now. We are collecting adult scallops offshore from Delaware to Georges Bank and finding plenty of microplastics in their guts. In addition, sea scallops are shellfish that many people like to eat. So there could be a potential risk for humans as well, particularly for shellfish where the entire animal is consumed. Q: How does the lab experiment work with larval scallops? A: First, we grind down larger pieces of plastics into irregularly shaped and sized particles, which is what you’d find under natural conditions in the ocean. The smaller we can make the particles, the better, since we’re feeding them to scallop larvae that are less than 90 microns in size. Then, we fill 10 different beakers of seawater with various concentrations of microplastics and place millions of larvae—just a few days old—into them. We’re exposing the larvae to microplastic concentrations that we think may interfere with their physiology, and to concentrations that we think will not. Often, when scientists do experiments like this, they expose the larvae to extremely high levels of microplastics, which you’d never see in the ocean. But we want to use concentrations that are environmentally relevant, so that we can assess if the health risks are actually real. Q: Once the larvae ingest plastics, how can you tell if the plastics are affecting the growth rates? A: We look at the larvae after their shells begin to develop using polarized light microscopy. That allows us to see very distinct patterns that indicate correct shell thickness and formation. If we see that the patterns are distorted in any way, it’s a good indication that the shell is not properly forming. Q: Is shell formation the only indicator? A: It’s one of the key indicators of scallop growth, but we’re also looking for the formation of lipid droplets, which is a storage compound the larvae use to concentrate energy during metamorphosis when they cannot feed for a few days. They rely on those lipid reserves to survive. Using spectroscopy, we can measure the size and volume of the lipid droplets inside the newly formed shells and from there, determine how much lipid they are storing. Q: What happens if you detect impaired shell growth and/or a lack of lipids? A: If we do see signs of inhibited growth, we can look at what microplastic concentration levels those animals were exposed to and relate those to levels found in the environment. We’ll be following these scallops all the way throughout their larval stage, which lasts about 40 days, and then running additional experiments in the future to track potential microplastic impacts during their sensitive juvenile and adult stages as well. This work will ultimately help determine if there are health risks associated with microplastics that we need to be concerned about.